During the summer of 2012 London played host to the Olympic Games. Apart from the achievements on the sports field of which the world was focused on there was another fascinating event taking place that involved over 1,000 buses and coaches from all over the United Kingdom. These vehicles were used to transport the athletes, spectators, media and the many volunteers involved with the Games to various venues throughout the country as well as the Olympic Park in Stratford, East London. This video programme features some of the operations in Weymouth where the sailing events were held. We then visit London, where our cameras record some of the movements at the massive Eton Manor Transport Hub and then on to Canning Town, the ExCel Arena and North Greenwich. Our filming starts in Weymouth on the esplanade where we see the regular operations of the local First buses as well as Wilts & Dorset and Damory. Special Games vehicles are also seen in this busy location. From here we move to the Swannery Transport Hub and witness the streams of brand new Wrights bodied Volvos operating the various Park & Ride services. 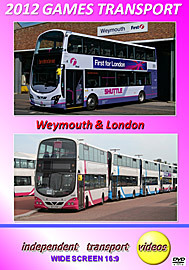 From more action in the town our cameras move to Portland Beach Road to see many of the ‘officials’ buses, mostly operated by GoSouth Coast vehicles, supplied by Wilts & Dorset and Marchwood. After a brief visit to the Monkey’s Jump Park & Ride in Dorchester we complete our visit to the south coast. The next part of the programme starts at the busy Eton Manor Transport hub near to the Olympic Park where we see buses from various provincial Stagecoach companies, Translink from Northern Ireland and some London operators to name but a few in action – it really is ‘wall to wall’ buses! Silvertown Road, Canning Town is our next location, and here we ride on Firstbus Volvo B9TL 36230 (BD12 TBY) to the ExCel Arena. Our final ‘Games’ visit is to the North Greenwich transport hub where most of the Translink vehicles are in service. We finish our programme with a visit to Piccadilly and Hyde Park Corner in Central London to see the current bus scene. A number of buses carrying Games sponsored adverts are seen together with some of the ‘special service’ buses passing through, not to mention the ‘New Bus For London’ making an appearance! So enjoy this very special event!